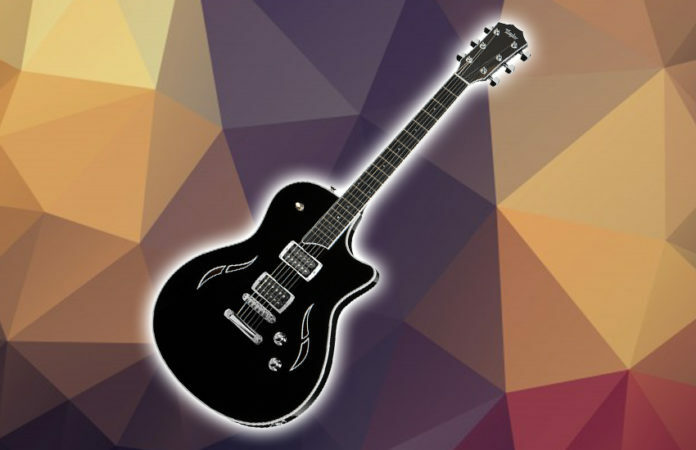 While the T5 melds acoustic and electric guitar properties into a versatile instrument that does a nice job across a range of applications, the T3 emulates that look while creating a true electric guitar that can compete with the best. In other words, the T3 aims for the best electric sound, even if that means sacrificing something on the acoustic side. Sharing the same thin line design as its T5 brothers, the T3 has a different construction, different pickups, and more durable hardware. According to most reviewers, it is. The T3 has a sapele wood body with a solid block running down the center. A striking flared maple top is attached to both the sides and the block without any additional bracing. Its T5 brothers have a braced hollow body, making for better acoustic sounds, but the Taylor T3’s body is all about the durability needs of an electric. The T5’s bridge also gives way to an electric-worthy solid bridge and stop tailpiece. A T3/B with Bigsby tailpiece is also available. 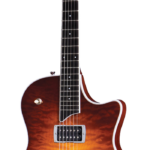 The T3’s pair of Taylor Style 2 HD humbuckers are wired to make this instrument retain as much versatility as possible. Choose to turn on only the neck pickup, select both neck and bridge or use only the bridge pickup. In addition, turn on a coil-tap and you get an old-fashioned single-coil buzz. You can even make the tone fatter by engaging a second capacitor. The T3 is great for jazz, but the knobs and switches mean players can take it out to front a rock band without reservations. No discussion of the T3 would be complete without some comments on that amazing figured maple top. Forget about the good things it does for the sound. Think about what it does for your image when you carry this guitar on stage. The beautiful maple top is given a natural finish so none of the grain gets hidden. While the look might be most compatible with a jazz quartet, it’s hard to see how this guy could ever look out of place. Taylor makes beautiful guitars. No one argues about that. But when you combine an exceptionally well-thought-out design with a body and electronics that have been re-engineered for the best electric sound possible, it’s hard to find anything negative to say. The Taylor T3 is an electric guitar that takes an already good sound and makes it even better. That’s why, if you can get your hands on this guitar, you will be making yourself a huge favor because i guarantee that you will love it.